A 45-year-old woman with a recent onset of dysuria presented with malaise, weight loss, and a low-grade fever. Flank pain was noted during the physical exam. Her relevant past medical history included a remote traumatic brain injury, which rendered her triplegic and wheelchair bound. 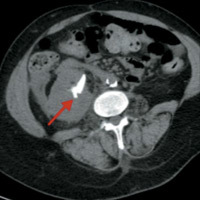 Reformatted coronal CT image (Figure D) highlights the loss of the normal renal outline secondary to moderate perinephric inflammation, which extends into the right lower quadrant (blue arrow). 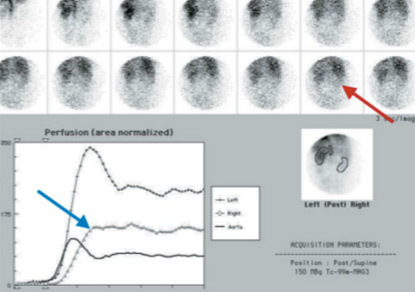 99MTc-MAG3 renal scintigraphy with IV Lasix confirms the presence of an obstructed, nonfunctioning right kidney, likely chronic given the reduced perfusion (Figures E and F). XGP is an uncommon granulomatous inflammatory response involving the renal parenchyma secondary to chronic urinary obstruction and urinary tract infection. Radiographic features usually are specific. A granulomatous mixed inflammatory infiltrate with lipid-laden histiocytes replaces the renal parenchyma. Over time, the inflammatory process spreads to nearby tissues surrounding the collecting system. Grossly, the kidney usually is enlarged with hydronephrosis and contains staghorn stones. A staghorn renal stone is a branched calculus that resembles the antlers of a stag (deer). It is usually composed of struvite and is associated with recurrent urinary tract infections from bacterial pathogens that produce alkaline urine. Renal enlargement from XGP may produce a fragmented staghorn. In addition to the obstructing stone, renal enlargement and nonexcretion of contrast material from the involved kidney constitute the classic triad of XGP. The diffuse form of XGP produces hypoattenuating masses arranged in a hydronephrotic pattern, which replaces the renal parenchyma. 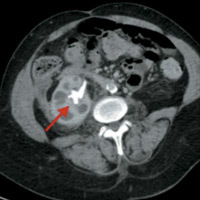 This appearance on CT has been described as the bear paw sign. Clinically, patients usually are symptomatic. They often appear chronically ill, and abdominal pain, flank pain, weight loss, fevers, and gross hematuria have been reported. Complications of XGP include perinephric abscess, nephroenteric fistula, and nephrocutaneous fistula. CT is the mainstay of diagnosis. Ultrasound of diffuse disease shows a large kidney with amorphous central echogenicity (usually secondary to a struvite stone), pelvic contracture, and numerous fluid-filled masses. MRI may be useful if there is an abundance of lipid-laden histiocytes (high-intensity signal on spin-echo, T1-weighted images). 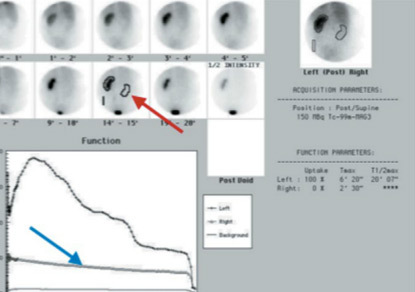 Retrograde pyelogram may show an irregular collecting system. On CT, findings include hydronephrosis, renal calculus, poor or absent renal function, intraparenchymal collection, cortical renal atrophy, abscess, and perinephric fat accumulation. More than 80% of the time, diffuse disease is found on CT. Treatment includes both surgical interventions and medical management. Nephrectomy usually is indicated in advanced disease states, while focal disease can be treated with antibiotics. Patients who are poor candidates for surgery or patients with bilateral disease also can start on antibiotics. — Omar Barakat, MD, is a radiology resident at the University of Connecticut Health Center. — Elliott Higgins is a third-year medical student at the University of Connecticut Health Center. Craig W, Wagner B, Travis M. Pyelonephritis: radiologic-pathologic review. Radiographics. 2008;28:255-276. Hayes WS, Hartman DS, Sesterbenn IA. From the archives of the AFIP. Xanthogranulomatous pyelonephritis. Radiographics. 1991;11(3):485-498. Rajesh A, Arumugam R, Jakanani G, Mayer N, Mulcahy K. Computed tomography findings in xanthogranulomatous pyelonephritis. J Clin Imaging Sci. 2011;1:45. Li L, Parwani A. Xanthogranulomatous pyelonephritis. Arch Pathol Lab Med. 2011;135(5):671-674. Akbar S, Jafri S, Amendoma M, Wiater B. Renal infections: an update. App Radiol. 2009;38(3):25-38.